Fabric Structures | Lightweight Manufacturing Inc.
We make fabric panels for frame supported fabric structures using kedered single bay panels or large multi-bay panels. We also offer engineering and design support to help you identify the best fabric to frame connection system and the optimum fabric for your application. We work with a wide variety of fabrics including PVC coated and laminated fabrics, polyethylene fabrics, Tenara, and clear fluoropolymer on glass yarn (Flexlight). Use of keder panels for permanent frame supported structures is popular because the keder connection offers a reliable connection that is easy to install by sliding in rectangular panels. Another benefit is that the fabric is always connected to the frame during each phase of the install. On aluminum frame systems, the fabric is almost always connected with keder since the keder track can be extruded in the main extrusions with no extra cost. 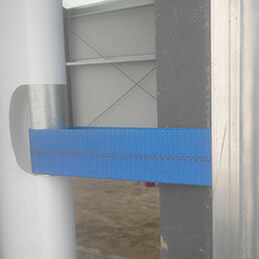 On a steel frame, the aluminum keder track adds extra cost and install work. Large panel systems are popular with steel frame supported systems. They can be tensioned with pipes and pockets at the edges of the panel. Large panels are most efficient when the shape of the frame allows for install without attaching to the intermediary arches. 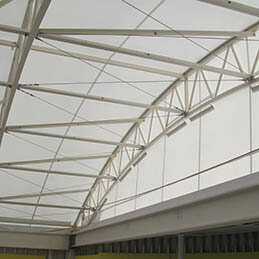 Do you have a fabric structure you need help with? Please fill in the form below, email us, or reach out to one of our experts at (610)435-4720.